Hokkaido is the northernmost prefecture in Japan. Abashiri city is situated on the northeastern coast of Hokkaido and faces the Sea of Okhotsk. There are also five lakes near the city. This area experiences four distinct seasons and has the climate of a coastal region. Abashiri enjoys a relatively mild climate as it has lower levels of rain and snowfall compared to other cities and towns in this part of Hokkaido. The population of Abashiri is approximately 39,600. Memanbetsu Airport is the gateway to Abashiri and provides flights to and from major cities such as Tokyo, Sapporo and Nagoya. It takes about 20 minutes to travel by car from the airport to the center of Abashiri. There are various archeological and historical sites in Abashiri, which provide evidence that humans have inhabited this area for the past 20,000 years. In 1872, the existing community was named Abashiri village, and its status was promoted to that of a town in 1902. Due to the opening of a railway in 1912, and the construction of a port in 1919, Abashiri has played an important role in land and sea transportation. 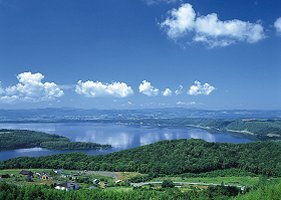 The coastal region of Hokkaido along the Sea of Okhotsk, to which Abashiri belongs, boasts one of the three largest fisheries in the world. Agriculture and forestry are also key industries in Abashiri. Livestock breeding and fish processing have grown to become important secondary industries. Alongside this industrial development, both prefectural and municipal government offices have sprung up. Various businesses and cultural facilities have also been created over time. In 1947, Abashiri was incorporated as a city and has continued to grow as one of the core cities in the Okhotsk area. The most prominent industries in Abashiri are fishery and agriculture related. The abundant supply of marine products found in the Sea of Okhotsk has allowed local fisheries to thrive. Fish processing has grown to be an important secondary industry. Agricultural activities mainly include dairy farming and the cultivation of a variety of crops. Forestry is another important industry in Abashiri and is supported by a rich supply of natural resources. Tourism is another well-established industry in Abashiri as the spectacular beauty of the lakes, the landscape, and the Sea of Okhotsk, with the drift ice it carries to shore each winter, are all very attractive sites to see. The Drift Ice Museum enables tourists to learn about this amazing natural phenomenon and see the drift ice even in summer. Another popular attraction is to take tours of the drift ice onboard the first icebreaker ship in Japan, the "Aurora". These tours provide a unique and memorable experience for all tourists. Abashiri is also famous for the Abashiri Prison Museum, which served as a real prison until 1984. Here many buildings that were in use during the Meiji era can still be viewed and the public can learn about the history of the prisoners and appreciate the roll they played in the development of Abashiri. The Museum of Northern Peoples enables tourists to find more information about the cultures of the northern hemisphere. Since Abashiri has so much to offer, it is no wonder that 2 million tourists decide to visit the city each year. 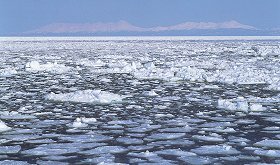 Drift ice is symbolic of winter in Abashiri and the Okhotsk region. 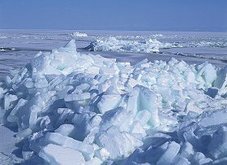 This natural phenomenon has had a tremendous influence on the local culture and the drift ice motif is represented in various forms of art, dance, and music. Abashiri even holds a drift ice festival each year. Each year ice forms near the mouth of the Amur River in Russia. It is carried southward by current and wind until it eventually rolls onto the coast of northern Hokkaido. In its first stage it has the consistency of sherbet ice cream. Then it gradually grows into a hard mass during the course of its long journey. Drift ice varies in its shape due to the effects of wind and tide. The final forms are strange and magnificent presentations of art made by the hand of nature. The Faculty of Bio-industry, part of the Tokyo University of Agriculture Okhotsk Campus, is located in the suburbs of Abashiri. There also are some sports facilities in Abashiri such as the "Abashiri Sports Training Field" and the "Okhotsk Dome", which is the first multipurpose gymnasium in Hokkaido. Abashiri would like to promote its sports establishments as they enable people to enjoy a variety of recreational activities while taking advantage of its scenic environment. Copyright © 2010 Abashiri City All Rights Reserved.